Posted 2 February 2015 & filed under 1920s, 1930s, 1940s, 1950s, 1960s, 1970s, 1980s, 19th century, Early 20th century, Factory work, Mercer, Mercer's Chronometers, Streets, Work. 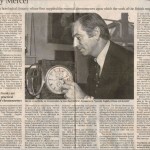 Mercers was a family run marine chronometer manufacturing business. The firm started in 1858 in Clerkenwell London by the founder, Thomas Mercer. Thomas was born in St Helen’s Lancashire in 1822. St Helen’s was said to be the centre of British watch making and it was here that Thomas first learnt the trade from his grandfather. He then moved to London to work for John Fletcher, an eminent chronometer maker, before starting out on his own. He moved his business to St Albans in 1874 when he found a suitable property called Verulam Villa, at 18 Prospect Road. By 1907, there was a need to build larger premises because output had increased dramatically. 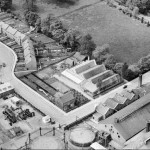 So in 1912, Mercers moved to a purpose built premises on the corner of Eywood Road and St Stephen’s Hill, near the gasworks, where they remained until the 1980s. 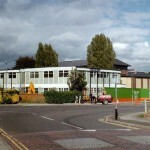 The factory was eventually pulled down and replaced with the Centrium office buildings. A history of this famous family business can be read in the obituary below of Tony Mercer who died in 2012. Details of the Mercer premises in Prospect Road which later became Ashwood Mews can be read here. A colleague of Thomas Mercer was Henry Travers who was also born in St Helens. The Travers family moved shortly after his birth to Rainhill a nearby village where his father worked for Thomas Mercer’s father as a Chronometer Maker. When Thomas Mercer moved his business to St Albans in the 1870s to Prospect Road some of the Travers family seem to have moved south also. Henry is listed as living at 30 Prospect Road (Crombie Villa) in 1911. Henry’s brothers John Richard were also Clock Makers working for Mercer’s.